If you’re a parent who is having a particularly hard time getting through your day today, we have just the video for you! Now, we can’t guarantee that it will make you feel better—in fact, the situation surrounding this event may make your heart start to race—but it does feature a mom that we know everyone out there will “get.” Spoiler alert: she just wants to eat candy in peace! Certainly not! We support you, Ashley! It’s safe to say that every parent out there has to indulge in a sugar binge every once in a while. You are NOT alone! But let’s talk about the elephant in the room for a second: why does she feel the need to lock herself up anyways? The mom actually answers this rhetorical question for us while holding up her half-eaten piece of licorice, “They [kids] want everything you have.” There is no truer statement in this world! Amazingly, this off-the-cuff video about what motherhood’s really like has officially gone viral. Ellen DeGeneres herself even brought Ashley on the show to discuss her motivation behind pressing the “record button” at the moment that she did. Pretty impressive, huh? It was during her interview that we learned that this is no ordinary woman—she is a mom to QUADRUPLETS! If we were her, we would be hiding in our pantry eating Red Vines too! Her four TWO-YEAR-OLDS – yeah, we started hyperventilating when we first learned of their age as well! – Indie, Esme, Scarlett, and Evangeline, are just gorgeous girls! Absolutely perfect, but, of course, like any two-year-olds, Ashley simply describes them as being “a handful.” No joke! 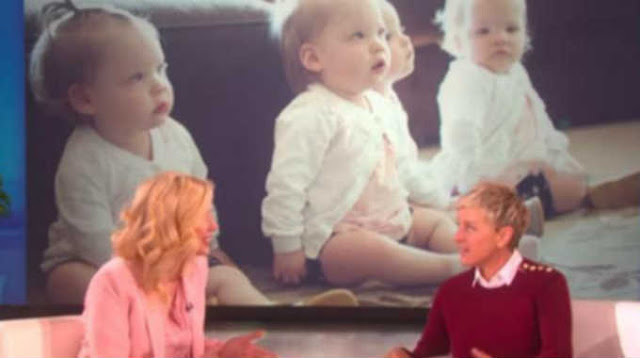 Ellen was gracious enough to bring the little girls on stage to meet the audience, but before the motley crew came out, Ashley regaled us with a description of what it was like to travel with her daughters from Utah to get to the taping in L.A. Listen closely to this story, families out there, it may make you feel a wee bit better about your last vacation with your little ones! Now, we’ve told you all about this mother’s desperate moment in her pantry, but we haven’t quite delved into what happened when one of her kids caught her in the act. To watch this mommy get seriously busted, go ahead and click on TheEllenShow’s video below. THIS is what parenting is like! What do you think of Ashley’s hilarious account of being a hungry mom? Have you ever snuck food when watching your kids before? If so, did you get caught in the act? Tell us all about your thoughts and experiences in the comments section below! This post was republished from tiphero.com. You can find the original post here.